This site is owned and operated by Newpages Network Sdn Bhd with the intention to provide business information about specified company. Newpages Network Sdn Bhd reserves the right to change or discontinue any aspects, features, or content of this site. The content of this website is for your general information purposes only. It is subject to change without notice. Newpages Network Sdn Bhd has the rights to all the proprietary content, designs, layout, unless otherwise specified. However, this site may contain syndicated materials and 3rd party articles; where if any, due acknowledgement would have been stated. Newpages Network Sdn Bhd seeks to uphold the copyrights belonging to others, and any inadvertent violation (if any) should immediately be notified to admin@newpages.com.my. You may not copy, modify, publish, or transmit any of the content herein in whole or in part for any purposes without the express written consent of Newpages Network Sdn Bhd. The materials presented on this website cannot be guaranteed as to the accuracy or timeliness. All information on this website is provided "as is" without warranty of any kind, either express or implied, including without limitation warranties of merchantability or fitness for a particular purpose and non-infringement. Newpages Network Sdn Bhd would not be responsible for damages or loss caused by any failure of performance, omission, inaccuracy, completeness, interruption, computer virus, unauthorized access to, and use of this site. Your use of this site is at your own risk. Advertiser use of any information or materials on this website is entirely at your own risk. It shall be your own responsibility to ensure that any products, services or information available through this website meet your specific requirements. Newpages Network Sdn Bhd will not be liable for any loss of use, data, profits or non-deliveries, misdeliveries, suspension or interruption, termination of service of the accuracy, reliability, availability and timeliness of the service. Links to 3rd party websites are provided for convenience since these sources may have some value and relevance. 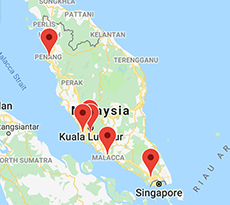 But these sites are not under Newpages Network Sdn Bhd´s control, and as such Newpages Network Sdn Bhd cannot and will not be responsible for the content or use of these sites. The inclusion of these links does not imply endorsement of any kind.